This is Hisashi Iwakuma. 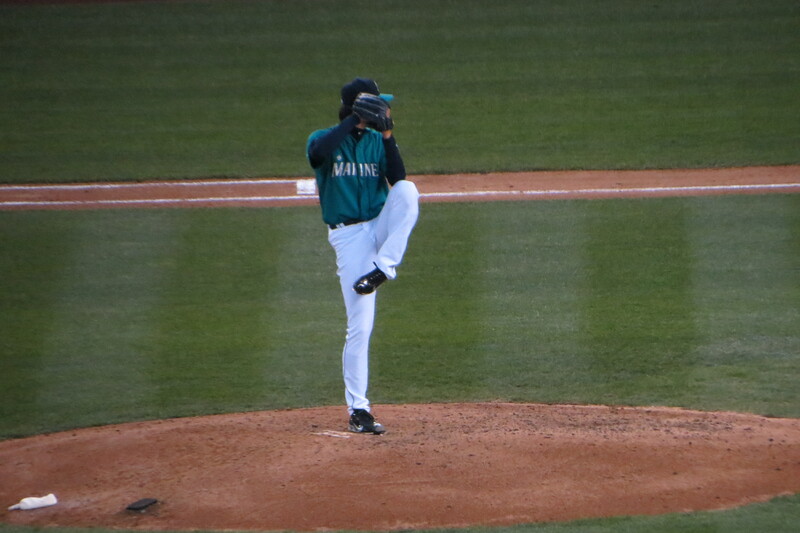 That thing in the air in front of him is Hisashi Iwakuma’s foot. I have pictures and video from the game on Wednesday that I went to with Daniel, but our internet “service provider” (I’m not naming them, if you live in Seattle you know who I’m talking about) had other ideas about my computer access early this morning. Sadly, the video I took of the holographic Moose will have to wait, as will a few really good shots of Matt Shoemaker (I know, boo Angels, but I’m an equal photo opportunist, sort of). Regardless of what photos I might be unable to post, the above photo is from one of last year’s games, when Iwakuma was a lot better than he was the other night. Saying Kuma had a bad start is putting it mildly, as he had pretty much lost the game by the end of the first inning. We were sitting in my old stomping grounds up in section 331, in the view box section in the fourth row, and by the end of the inning, I started really watching Kuma’s delivery. And it didn’t look like the picture above. In fact, if I could have posted this morning from my laptop where my photos are, I could have demonstrated how much differently he was pitching the other night. Hisashi Iwakuma is one of those rare gifts I get, a pitcher whose movements are so predictable that I have been able to take the above shot many, many times. As I have mentioned previously, the highest shutter speed I am able to get on my camera is, sadly, not as fast as I’d like it to be, nor is it really adjustable (unless I’d like it to go much slower), so I have to learn how players move if I want to get action shots. Iwakuma is an easy one, because when he kicks his left leg, he holds it and points his foot as above, then brings it down to plant it in front of him for his delivery. But Wednesday, he wasn’t really doing that for the first two innings. In fact, if I had access to the photo I really wanted to post, you’d see that he was actually kicking out, instead of up, then down. There’s nothing wrong with this – a lot of pitchers kick out, it’s just how they throw – but it clearly doesn’t work for Iwakuma, and it really didn’t work Wednesday. Yes, a lot of my knowledge of players comes from simple observation, and sometimes when you can’t watch all the time, consistent player mechanics are not that easy to trace. But Kuma seemed very rushed out there the other night. Daniel and I discussed it in length, as it was a very distressing thing not only for us but for the Ms fans around us, and thought perhaps the clock got into his head, or the staff had told him to do something differently, or maybe he just changed it because if someone like me can see how he times himself, an opposing hitter can certainly pick up on that. But I don’t know if it was any of those things, as it hasn’t been discussed anywhere that I have seen, and Iwakuma himself does not seem to have addressed it at all. All I know is, I want it back, and will be interested to see how he does further down the line this year. Mariners at Oakland tonight after a very odd off-day (seriously? It’s a two hour flight!) and it will be Taijuan Walker against Drew Pomeranz. I am going out to dinner with a friend, but the place we’re going I think might have sports on TV; if they do, I will see about sticking around for a bit at least to see how Walker does vs. the A’s lineup. Meanwhile, I will hope that the next time Hishashi Iwakuma takes the hill, he settles down before giving our opponents four runs.